Where Do Medical-Surgical Nurses Work? What Is a Medical-Surgical Nurse? The Medical-Surgical Nurse or "Med-Surg" Nurse has a broad array of knowledge that is applied in the fast-paced environment of the surgical operating room. The daily schedule or yearly agenda of these nurses is difficult to predict due to the many different types of patients that they see and treat. Typical tasks may involve caring for a patient who is rapidly deteriorating and required a higher level of care as well as patients who are stable and being discharged home. A busy and often stressful hospital environment is common. When nursing was a younger profession, the majority of nurses worked in wards performing bedside care, and most were classified as medical-surgical nurses. Currently, med-surg nurses work in a variety of positions both on the hospital floor and beyond. Medical-surgical nursing is often the first step that a newly licensed RN takes in their professional career - and for a few good reasons! Jobs in bedside post-operative patient care are some of the most abundant in the industry, meaning there are a wealth of job openings. There is considerable support from other nurses on the floor, and many opportunities for learning as part of the healthcare team. In general med-surg, there is an array of patients that come through each day, week and month, greatly informing the new nurses experience, practice and perspective. What Are the Education Requirements for a Medical-Surgical Nurse? Nurses who graduate with an ADN or Associate's Degree in Nursing are hired into the medical-surgical specialty quite often. However, a BSN or Bachelor's degree is increasingly preferred and continuing on to receive this degree after hire may be a condition of employment. Newly graduated nurses will find internship programs for the medical-surgical specialty at most hospitals. Internships involve a didactic component as well as a preceptorship with an experienced nurse. 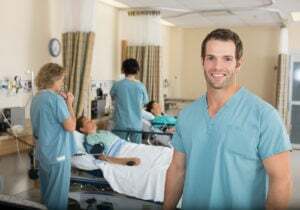 Experienced nurses who opt to transfer into the medical-surgical unit should also ensure they have an appropriate training program, but often this is not as in-depth as the new graduate internship. The Certified Medical-Surgical Registered Nurse (CMSRN) certification for Med-Surg nurses is available after about two years of employment. Often a raise in pay and reimbursement for the exam is offered by hospitals for nurses who complete this certification. Contact hours to renew the CMSRN are required, along with proof of employment as a Medical-Surgical RN and having an unencumbered RN license. Medical-surgical nurses work in a variety of settings far beyond the hospital ward. Some of the more common work environments include inpatient clinics, HMOs, hospital and regulatory administration, teaching, outpatient or ambulatory care, home health care, nursing homes, and the military. The Medical-Surgical nurse is responsible for being an expert in a wide array of conditions that patients present with on the Medical-Surgical floor of the hospital. Patients on this unit may have a medical issue such as a disease or illness, or may be recovering from a surgical procedure or preparing for one. Any of these issues requires close monitoring by the Med-Surg nurse for any changes in condition or the need to transfer to a higher level of care. Due to the range of experience that a new graduate stands to gain as a medical-surgical nurse, these positions are highly coveted by newly licensed and practicing nurses. What Are the Roles & Duties of a Medical-Surgical Nurse? Works independently under the supervision of the manager or charge nurse to implement care goals for patients and professional goals for themselves. Prioritizes patient care and associated issues to determine appropriate interventions. Grows current competencies through didactic and experiential learning, as well as contact hours and certifications. The Bureau of Labor Statistics predicts a steady increase in the number of nursing jobs available between now, 2020 as our healthcare system continues to develop, and the mean age of patients continues to rise. This means that there are a number of opportunities for new nurses to become established in the field and get started on their career path! The average salary of a Med-Surg Floor nurse is $62,472 with a range of $36,512 - $92,282. As with any nursing specialty salary is dependent on a nurse's location, experience, education, and relevant certifications. While hard data is difficult to extract, nurses may start with finishing their BSN degree for a general boost in salary.